It would seem that someone is doing a lot of chattering about repealing the Second Amendment. Whether it comes from folks on our side talking about those who want to do it or from folks on the other side who want to do it, it sure tops out all of the other amendments. At least it looks like Amendments 9, 20, and 27 are safe. You know what it could be, for every single mention of it on “the other side” you guys go wild with dozens or even hundreds of responses. That’s pretty funny when you think about it. Actually, I think that’s great. It means our community is informed and engaged. And that’s why we win. It would also mean, contrary to claims, that people are talking about banning all firearms, wouldn’t it? what mikey, you thought we’d simply go quietly into that gentle night? What … are you drafting Sugarmann’s next HuffPo article? Personally, I wouldn’t mind repealing the 20th Amendment, provided the new starting days for President and Congress were earlier than they are now, rather than later. I really don’t like having the Tyrannocrats Rex in office, totally unaccountable, for over two months after they’ve been defeated. I’m surprised the repeal of the 16th Amendment doesn’t do better. Personally, for all the talk on the Right about repealing the 17th, I think that repeal of the income tax is both more doable, and also more likely to result in real change for the better. Even if by some miracle you did get people to voluntarily give up their right to vote for Senators, most states would probably quickly reinstitute that right at the state level. As for repealing the 16th? Never going to happen – at least not this century. Too many States want too much Federal money to vote for it – hell, too many people want too much Federal money. Big Government of the sort you can’t feed off excise taxes alone is simply far too popular… especially when people who pay no Federal income tax are the majority. I’m surprised the 18th Amendment didn’t do better, since it’s the only one that actually was repealed. It figures that no one talks about repealing Robert Bork’s ink blot, since it never seems to accomplish anything, anyway. Amendment 3 seems pretty safe, too, for the same reason. I don’t think repealing the 2nd Amendment would necessarily mean total gun bans and gun confiscations. It would simply mean that you guys would have to stop justifying your gun ownership with the anachronistic and manipulated, albeit endorsed by the Supremes, argument. In theory you could still be allowed to own guns for self-defense and hunting. Do you think it’s only the 2nd Amendment that prevents total gun eradication in America. I don’t, and I’m not referring the the 3%ers. Mike, I agree in that repeal of the 2A would not necessarily mean total gun bans and confiscation. Many folks around the world own arms and don’t have such protection against government action. However, I for one am happy for the guarantee, and also know that many of my fellow Americans are happy for that guarantee. It means far more than here-and-now right to gun ownership. The right and reason for free people to wield deadly force is not anachronistic. That argument that it’s not needed anymore is simply incorrect, and highly dangerous. As if I needed that reinforced, I recently toured some of Germany’s concentration camps. No thanks … I shall keep my arms and work so that my fellow Americans keep them, as well. See this is the major difference between us. n theory you could still be allowed to own guns for self-defense and hunting. You see things in terms of the average person being “allowed” to do or to own something. I see things in terms of the average person being protected from the government in terms of what they do or own. The point that I was trying to make and it seems to have gone straight over your head is simple. One of the arguments you make (along with the antis like the Brady Campaign) is that no one is trying to ban all guns. That no one is trying to repeal the 2nd amendment in order to do that. 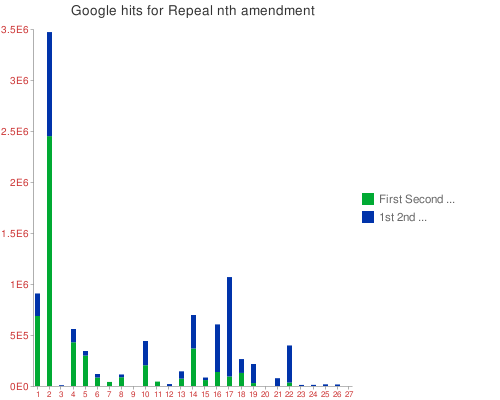 If there are many internet searches on “repealing the 2nd amendment” then what you and the other antis say is obviously false. I think you are correct. I’d like to point out another, related issue regarding what you are saying. How many times have we read about X state voting to “allow” the carrying of guns into establishments that serve alcohol? Or about Y state that voted to “allow” the carry of a firearm without a state-issued license? That whole issue of “allowing” this or that … we have been conditioned to see things that way, but it’s completely wrong. What is truly going on is that states are voting to repeal prohibition on X or Y … not to “allow” it. When you see things from a freedom perspective, we have the right to bear arms. That we must have a license, or must not carry guns into restaurants are infringements on that right. So, states are not voting to “allow” such things … they are voting to repeal prohibitions on them. At the end of the day, the people have the right to bear arms. But “allow” implies that government is bequeathing permission, but nothing could be further from the truth. The truth is that government has no authority to grant or bequeath such permissions, nor the authority to infringe in the first place. The philosophical difference is huge. And it’s a difference that most don’t understand, and that a few wish to obfuscate. The difference in the scenarios I described above is nothing less than a PERVERSION of history, and a perversion of our understanding of the relationship between individual rights and government powers. You’re right. What I say is anachronistic is that the 2nd amendment has something to do with it. What’s the “obviously false” part Bob? Is it when we say no one is coming for your guns? What I said in my first comment on this thread, which Bitter sort-of endorsed with “I think that’s great,” is that most of those hits are from pro-gun folks. You like to throw out that accusation of “obviously false” too easily. What we’re suggesting is there is no serious attempt to repeal anything, and even if there were it wouldn’t necessarily impact on gun rights. Aren’t you guys the ones who keep saying the “genie is out of the bottle?” Nothing’s gonna change that, Bob. No one is coming for your guns. You’re slipping into your grandiose victimism role again. You can’t keep your story straight! First you say “for every single mention of it on “the other side” — meaning that people are mentioning in it and the response is overwhelmingly pro-rights. but people are mentioning it on the other side. Then you complain when I point out that people are talking about repealing the 2nd and doing away with our rights. Is it when we say no one is coming for your guns? Either you can’t remember those statements by the antis or you are lying about it. Which is it? So why don’t we ban them? Prohibit their manufacture, importation, possession. The United Kingdom did. So why can’t we? Schumer is still in the Senate — Metzenbaum I’m not sure. Old Quotes yes, but that doesn’t mean the tiger has changed his/her stripes, eh? And I’m sure your English counterpart tried to sell the same line of crap over there. Now look at the state of the country and personal rights. Tell it to the other people Sparky, we aren’t buying it here. If there are no serious attempts to circumvent our rights; please explain with legal citations, moral/ethical/philosophical citations — JUST EXACTLY how the gun ban in Chicago isn’t a deprivation of our fundamental rights?